The splendid folks at EA Mobile have kindly shared some teaser screencaps of NBA JAM for the iPhone and iPod Touch with us. 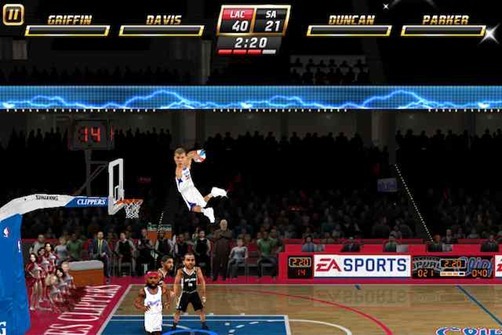 As you can see above, the game looks to be way underestimating Blake Griffin’s jumping ability, but also looks big fun. 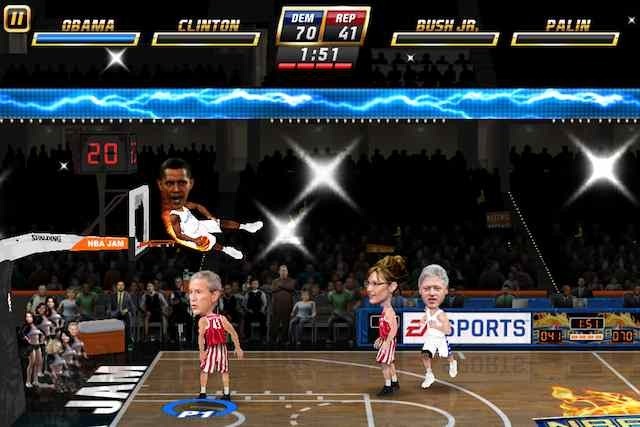 NBA JAM is about to set your iPhone/ iPod touch ON FIRE with all the over-the-top, high-flying, 2-on-2 arcade basketball action just like you remember it – and like you’ve never seen before! So go to the hole. Go strong. Go for the monster jam. KABOOM! HEAT UP ON iPHONE & iPOD TOUCH. Slam and JAM with all 30 NBA teams, favorite NBA stars, dozens of unlockable legends from the classic arcade era, plus some secret players you can only get on iPhone/iPod touch. Unlock outrageous cheats, too. You up for some “Big Head” action? PLAY NOW! PLAY CLASSIC! IT’S SHOWTIME! If you’re from the Old School, you’ll feel the ‘90s nostalgia while you play the hottest new arcade sports game on the App Store. Featuring the voice of Tim Kitzrow the original NBA JAM play-by-play announcer), you’ll hear all the classic catchphrases plus a few new ones recorded just for this game. This JAM is all about “boomshakalaka” !